She then mentioned how API (Asian-Pacific Islander Club) has never been the same since I left. It’s been exactly four years since I’ve last set foot onto my high school grounds; and, as strange and cliche as it is to say, it really is a mind-trip to visit the place you grew up. “Everyone liked you,” she reflected. “I just remember T standing outside API with his flowers, scared and nervous to ask you to a dance,” my friend laughed. “Whatever happened to that one guy you dated?” my teacher asked. “In fifty years he’s gonna say that he wrote that song about you,” my friend joked. In my private Catholic high school, yes, I was that girl. 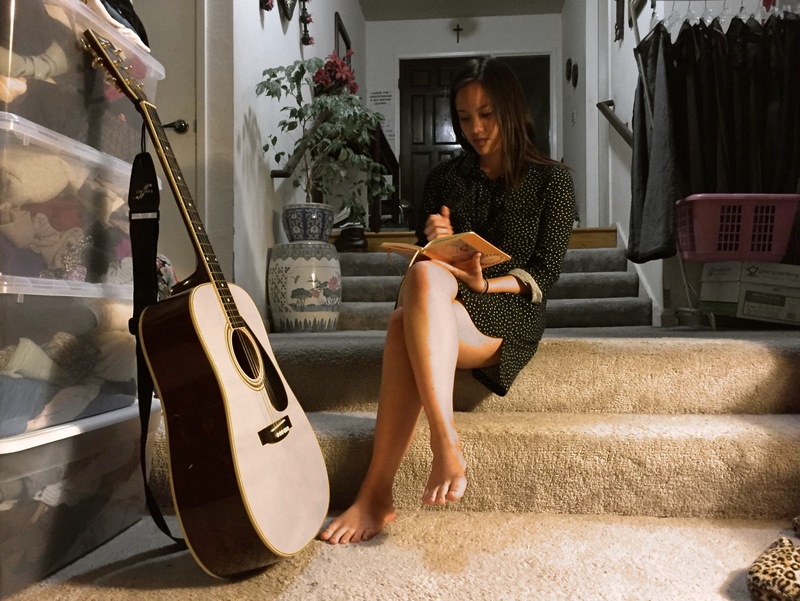 I was your average “good girl” and “girl next door.” I was that quiet but “pretty girl” who found comfort in her blogging, playing guitar and cultural dancing. I taught my classmates how to cultural dance and kept myself happy playing my music. I was happy as a bee and never sought others for “approval,” as long as I was doing the things I loved, at the disposal of nobody but myself. “All the boys just seem to flock to you,” I remembered my teacher telling me back in high school. For me, I was never totally excited about all the attention I received. I grew up influenced by role models who taught me about self-love; I had a sense that I was well-aware of who I was–that all I needed was my music, writing and friends to keep me happy. I guess I had a sense of “pride” in myself and felt that I was meant for so much more. As I walked around my high school, things were… exactly the same. The lockers I used to open everyday; the hallways I used to hang out with “the asians”; the bathroom I cried to my friend in after a boy frustrated me; and the tree I sat under as my friend recorded a video of me saying, “That’s a mighty big book you have!” Even my teacher seemed to look, behave and talk the exact same way as I remembered in high school. It was as if time stood still. “Every time people come back and visit, I forget how long it’s been and then you tell me it’s been that long and I’m like, really? !” she reflected. When she said that, it made total sense to me. In my small town, as you’re living your day-to-day of going to school, going to work, picking up the kids, wearing the same dress code and seeing the same people, you’re numb to the life that exists outside of this town. “I was one of those kids,” I reflected. Ever since I’ve graduated high school, I’ve really taken ownership of who I am and pushed myself to put myself out there. (Warning: I apologize for the laundry list to follow.) I’ve gotten heavily involved with one of UC Irvine’s biggest student organizations with Kababayan; I’ve choreographed a suite of 60 students for PACN; I’ve directed a 300-cast student-run production; I’ve reported at a red carpet press event; I’ve befriended music manager Mike and Meg & Dia, a band I’ve grown up listening to for almost ten years; I’ve held interviews with musicians I thought I’d never have the chance of interviewing; I’ve written published articles and expanded my network enormously within the music and journalism world… These are all things I would have never expected to do coming out of high school. But, I’ve always been that kid who just did what she was told, as long as a part of herself wanted to do it as well. As I returned to my high school, that quote became so relevant to me. It’s scary to realize when you’ve allowed a part of yourself to become so wrapped up in a life chasing success after success, constantly trying to put your name out there. But, don’t get me wrong, when you’re young, that ambition isn’t bad (for I’ve always believed that genuine hard work pays off). But sometimes, at the end of the day, you value those genuine connections with people that you can’t seem to find in your everyday relationships. Home, to me, is the place you feel most alive. It is where you feel most in your element and able to be your best self. It is the place where you can use and utilize your gifts and talents to share and give back to the world. When I returned to my hometown, I almost felt like a “fish out of water,” removed from the place that inspires and motivates me. The saying, “You can take the girl out of the small town, but you can’t take the small town out of the girl,” became so much more relevant to me after this trip. My hometown, although it is a place that I can look back on with happy memories of all the people who have come into my life to shape me into the person I am today, is (and it is scary to admit) no longer my home. As much as I would love to come back and be with family and become my teacher’s “nanny” for her kids, further developing those friendships and relationships that have made such a profound impact on my life, I know that a part of me needs and wants and craves to chase after the life my soul’s always wanted–one that inspires, motivates, and keeps me happy doing the things I love. It’s strange how our dreams and ambitions can take us away from the people we care about most. But deep down, the place where we find those we are closest to may not always be our “home.” And we ought to always be in the places we feel we can contribute our best selves… Even if it hurts. This is truly inspiring. I understood what you meant, and that last paragraph is very true and the feeling of bittersweetness overcame me.